The USA Ultimate National Championships are being held in Frisco, TX October 17-20th. 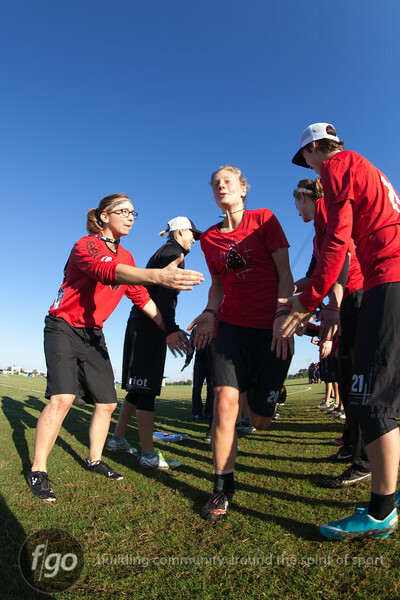 First of the match-ups are now published from day 1, the first three are what was coveredfor the day in the women's division games including, Phoenix (Raleigh, NC) v Riot (Seattle); Showdown (Austin) v Nemesis (Chicago); and Heist (Madison) v Riot. Mixed Division games are up: Mischief (San Francisco) v Wild Card (Boston); and Cahoots (Asheville) v The D'oh! Abides (Seattle). Men's Division game between Doublewide (Austin) and Ring of Fire (Raleigh) and Ironside (Boston) v Doublewide are also included.